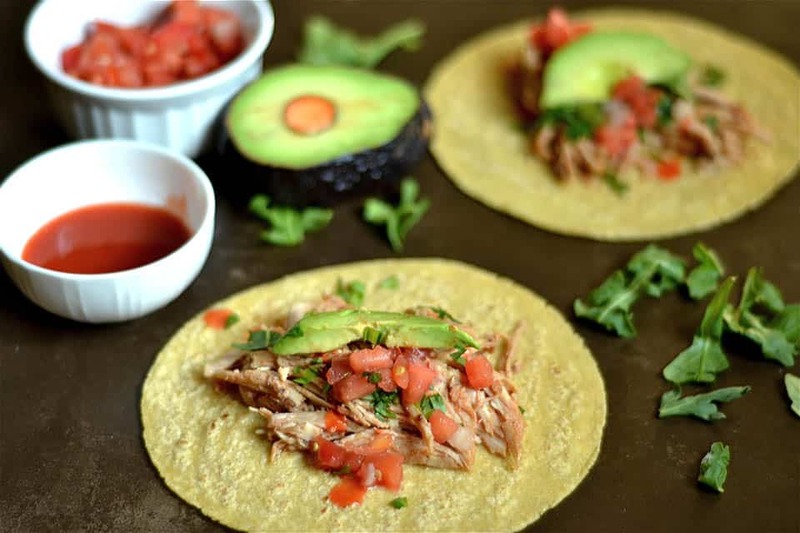 Slow Cooker Honey Buffalo Chicken Tacos are the perfect easy weeknight meal. Only 4 ingredients to throw into your crockpot and dinner will be ready when you arrive home! It doesn’t get better than this. Taco Tuesday has never been easier. 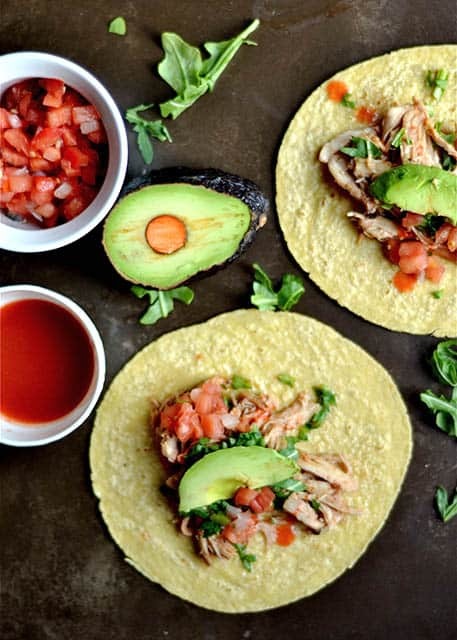 The spicy and tangy taste of buffalo sauce combined with the sweetness of honey makes a delicious sauce for shredded chicken tacos. I only threw 4 ingredients into my crockpot, left for the afternoon, and didn’t have to worry about what we were eating for dinner. It was glorious. 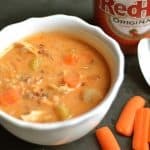 Anyone else love buffalo sauce as much as me? It’s kind of my favorite condiment. I am a sucker for spicy and tangy (I’ve been known to eat a jar of pepperoncinis in one sitting). And yes, I often toss it on my tacos. For the most part, I do prefer ground beef tacos for Taco Tuesday. 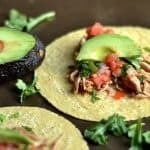 I have to get a bit more creative to make chicken tacos super yummy (one of our favorite meals is Slow Cooker Creamy Chipotle Chicken Tacos). When I made my Slow Cooker Sweet and Spicy Meatballs last December, I knew I would love to do a taco version with similar ingredients. Don’t ask why it’s now August and I’m now finally sharing. Let’s just say it’s been a busy few months……mmmkay?? 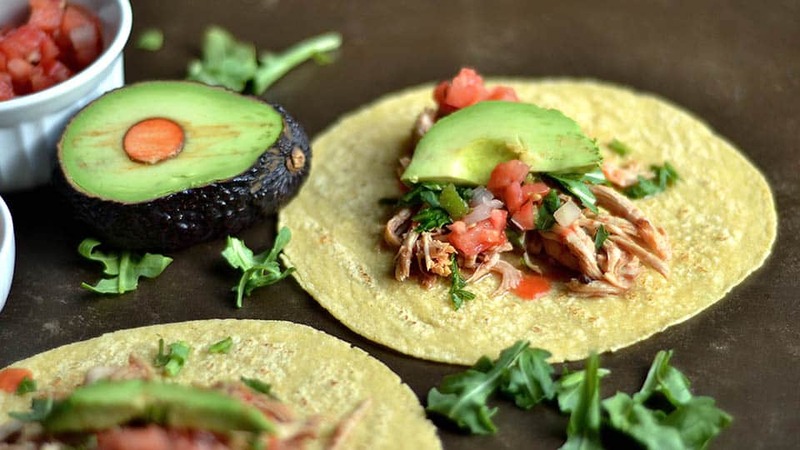 But in all seriousness, I’m excited for another variation of tacos to add to my rotation! I topped with all of my favorite things: avocado, cilantro, arugula, tomatoes, and onions. I *might* have added even more buffalo sauce. 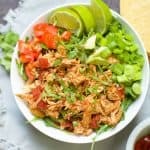 The chicken is also very versatile and would be great inside a lettuce wrap, as a filling for enchiladas or burritos, or on top of a salad. 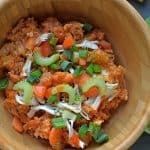 A much lighter variation than fried buffalo wings! And of course, my kids never complain about anything taco night, they were in heaven. LIne the bottom of your slow cooker with the chicken. In a small bowl, mix together the remaining ingredients. Pour on top of the chicken. 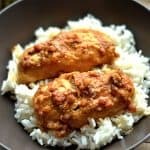 Cook on low for 4 hours, and shred chicken with a fork. Serve immediately inside a tortilla, on top of greens, or inside a lettuce wrap with all of your favorite fix-ins.